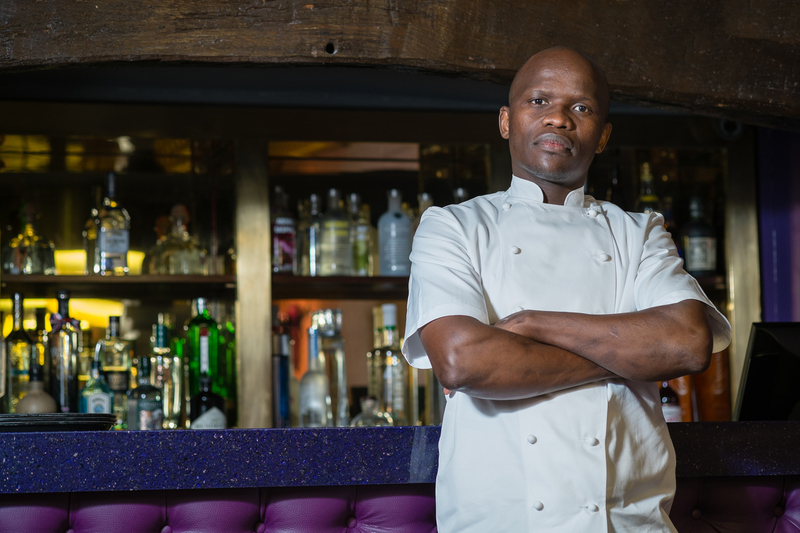 Petrus Madutlela has earned his place as head chef at The Hengist Restaurant, Aylesford. He has an impressive CV, having learnt to cook from Margot Janse and represented his native South Africa in the ‘Jeunes Chef Rôtisseurs Competition’ winning 4th place out of 21 countries. He won the South African “Unilever Chef of the Year” award in 2010 and was chef of the year, by invitation, for 2011. Petrus didn’t know the first thing about being a chef: “I’ve learned to love cooking” Petrus admits, “I just kept asking questions and kept reading books. You have to have a vision, have to see something and know you are fortunate.” Petrus grabbed the opportunity with both hands and threw himself into the job with vigour. Petrus is a positive person with the brightest smile this side of the moon. His smile is infectious and his happy nature goes hand in hand with the success and contentment he has found in his career. “The secret is to have a smile on your face. The smile changes life. People feed on that smile and energy.” Petrus’ philosophy in life is clear and makes him a likeable character. He has attracted a certain amount of fame since taking part in MasterChef in 2013 and is currently in South Africa filming ‘The Ultimate Braai Master’ television cooking competition but this time instead of being judged, Petrus will do the judging as a judge and mentor for the series. When I ask him about his fame, his smile fades a little. It is not a concept that sits easily for him and he doesn’t think he can class himself as famous. Even so, he is recognisable and his eyes light up when he speaks about his MasterChef experience: “It was the second time I had applied and when I got through I was so pleased! Everyone works to be successful at what they do, The Hengist organised cover for me and so I went for it! 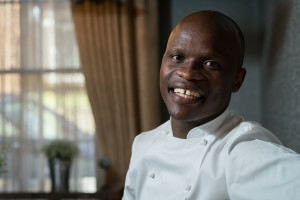 I’m from a township in South Africa and then on MasterChef!” He was sworn to secrecy about the results of MasterChef due to the delay between filming and going out on air, so when Petrus saw Michel Roux Junior at a food festival before the programme aired everyone was wondering why Michel greeted Petrus with such excitement. One of his favourite dishes to cook is South African ‘Pap en Vleis’ similar to polenta meat salad and a staple dish in South Africa everyone knows. It is a simple dish but seems to bring joy to Petrus to make it “Food brings people together.” he explains. 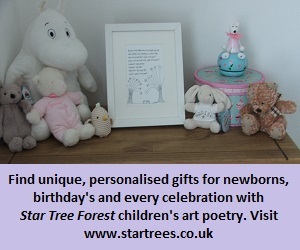 His own family all love to get together for mealtimes especially in South Africa, and here in England his young son is already showing signs of a chef’s palate – he opens the fridge and simply eats the broccoli heads and Petrus laughs as he tells me how much his son loves raw food. “I do cook for him though!” Petrus adds. His sentiments are given from the heart, and from experience, but even so, Petrus still can’t bring himself to eat cabbage, raw, fried or boiled! Take a look at The Hengist menu at http://www.hengistrestaurant.co.uk/menu.php.